It has been a long time semiconductor houses invested in a flagship product. Wolfson announced the WM8471 in 2007 and ESS announced the Sabre DAC in 2008. Recent investment has been concentrated in DACs for the broad consumer industry especially for the mobile segment. It is good to see a company still interested in investing resources for the “audiophile” segment. 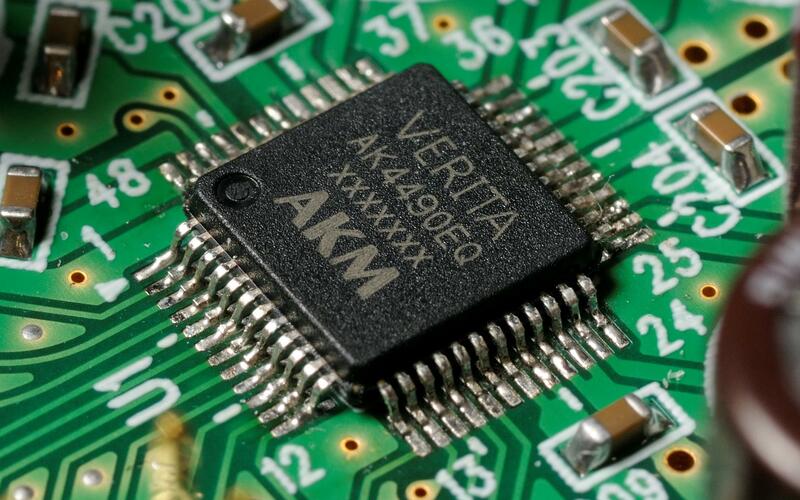 In order to “recover” the lost S/N in the new device as compared with the old device, The AK4490 can be operated with an analog supply of up to 7.2V. At 7V we gain 3dB S/N resulting in 126 dB for mono operation and therefore meeting the best specification of the old A4399 part. Thus one of the “mods” that can be made in this DAC is to run the DAC at the higher-end of the analog voltage operating spectrum. Linear phase Sharp Roll-off (AKM notation: “no delay”): this is the “standard” sharp roll-off filter found is all DACs. It is also known as the “brickwall” filter. It is said that pre-ringing sounds unnatural. Linear phase Slow Roll-off (AKM notation: “no delay”): this is also a “standard” filter found in all DACs. 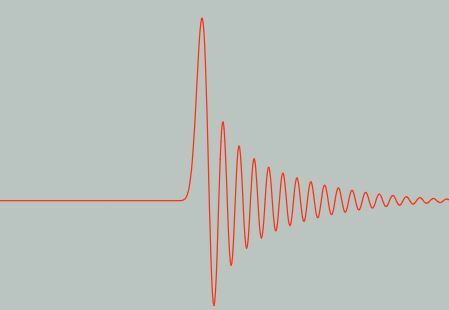 As in the linear phase sharp roll-off filter, it also generates pre-ringing, but trading lower amounts of pre-ringing with letting more aliased image through (theoretically increasing harmonic distortion). Minimum delay Slow Roll-off (AKM notation: “short delay”): this is a “more modern” type of filter also found in the Wolfson WM8741/8742 DACs. In addition to eliminating pre-ringing, this filter also incorporates slow roll-off and this reduces post ringing as well. The properties of this filter are similar to the “MP filter” found in Ayres latest CD player. 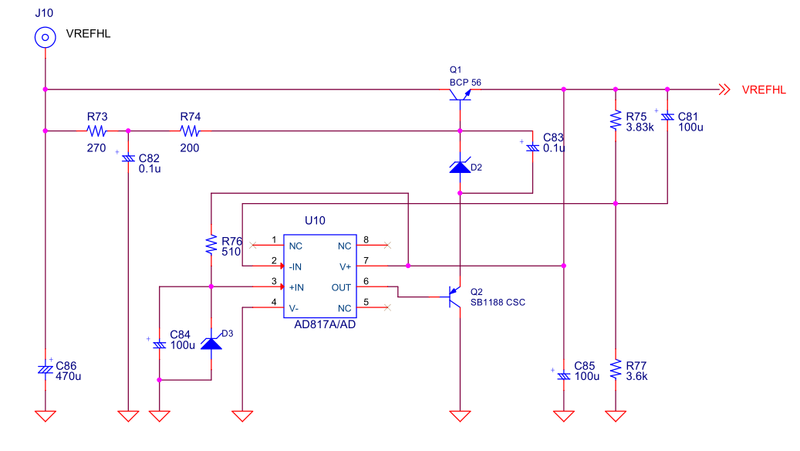 Super Slow Roll-off: this filter is the differentiating feature (in terms of built-in filters) that this DAC provides. The AKM literature says “super slow roll-off filter with emphasized characteristics” (which really means nothing). There is some information in the marketing page as shown below. According to AKM, the volume control module and the delta-sigma modulator can be bypassed for DSD resulting in “direct” DSD rendering. 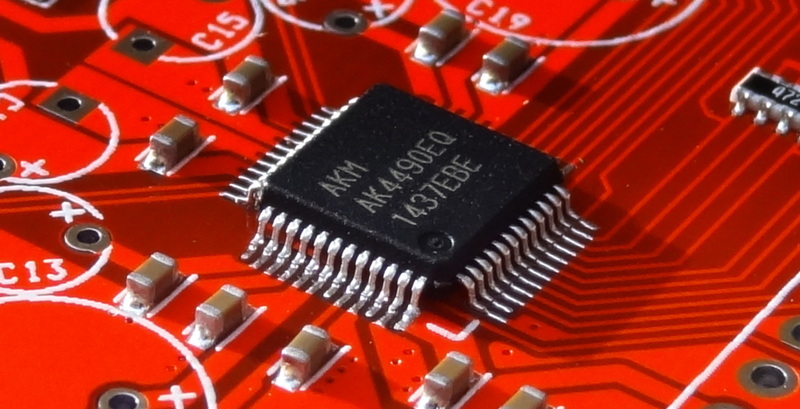 The AK4490 contains an integrated low-pass filter specifically for DSD data. The ultimate specified performance for SACD (as described in the Scarlet Book) can be easily realized with a simple external analog filter. Notice the bypass path for DSD Data. The DSD data is received by the DSD interface and sent directly to the “SCF” (Switched Capacitor Filter) block. DSD filter can be selected at 50KHz, 100KHz or 150KHz cut-off. Just like the WM8741, the AK4490 supports “direct DSD” processing bypassing the volume control and delta-sigma modulator. And like the WM8741, there is no automatic switching between PCM and DSD. 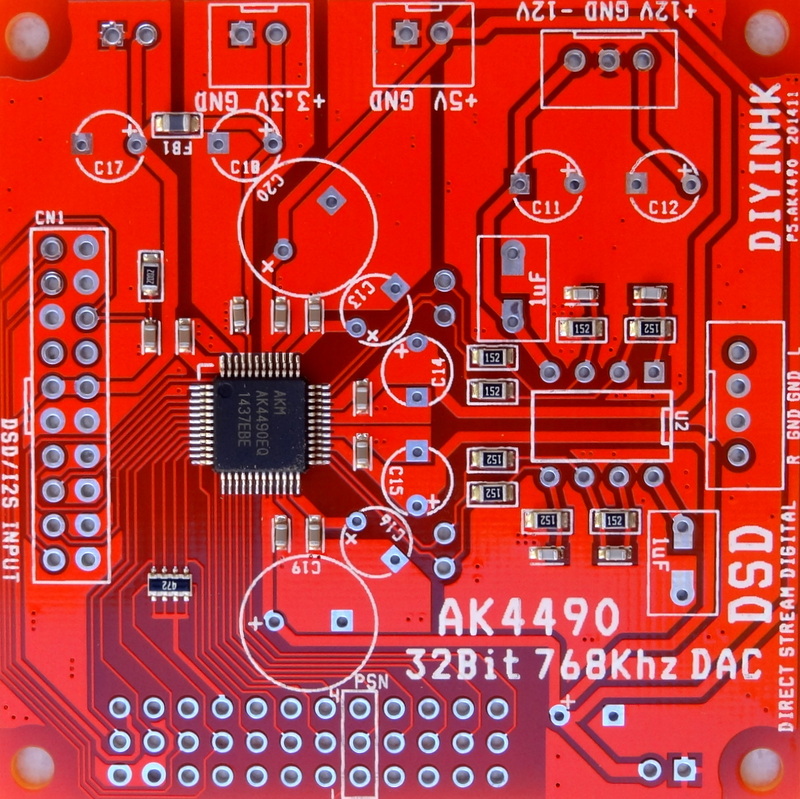 The AK4490 DAC follows the mapping of the AK4399 which switches channels with the “conventional” channel mapping of USB interfaces. Likely it was the USB interface designers that took notice of the ESS9018 DAC and conformed the channel mapping to that chip. The Diyinhk implementation follows (mostly) the AKM evaluation board and data sheet [link] but maximizes performance whenever possible (like in the selection of capacitor type and value). 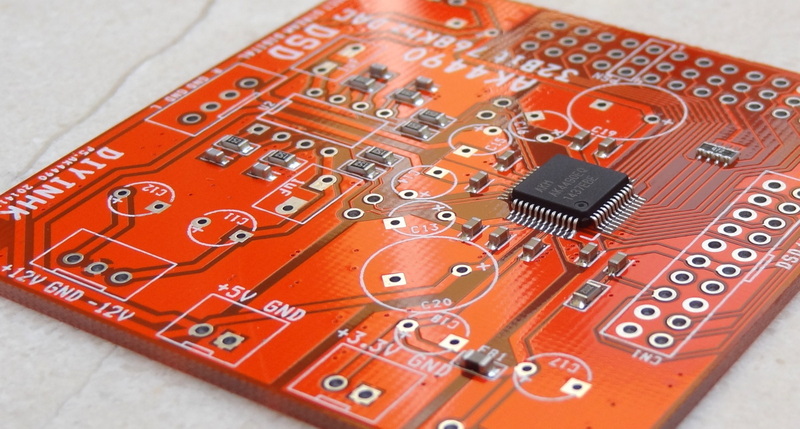 The board is powered by: 5V line, 3.3V line and +/- 12V line (for the output opamp). To minimize coupling by digital noise, decoupling capacitors should be connected to AVDD and DVDD respectively. VREFHL/R and VDDL/R are supplied from analog supply in system, and AVDD and DVDD are supplied from digital supply in system. Power lines of VREFHL/R and VDDL/R should be distributed separately from the point with low impedance of regulator etc. 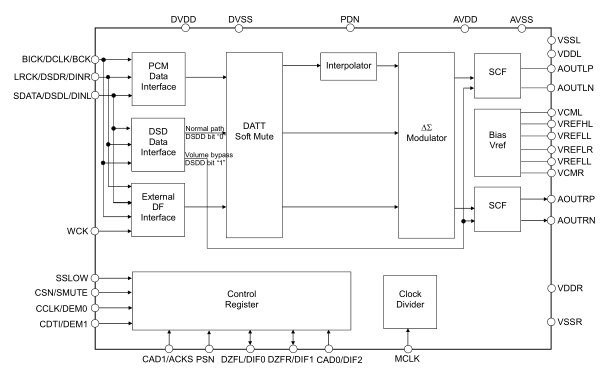 AVSS, DVSS, VSSL and VSSR must be connected to the same analog ground plane. 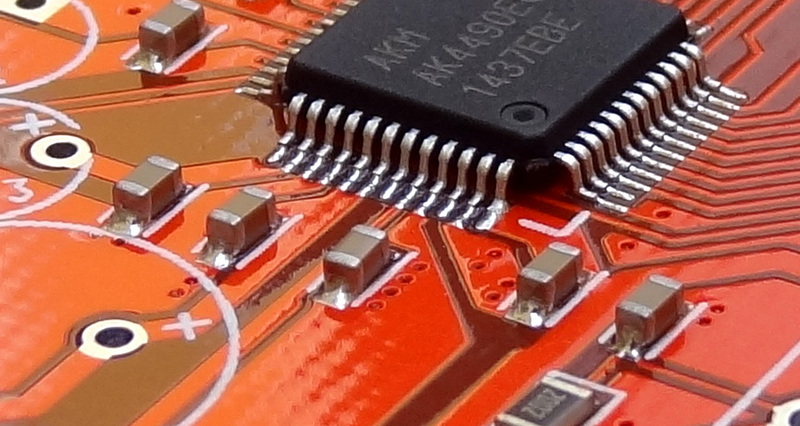 Decoupling capacitors for high frequency should be placed as near as possible to the supply pin. 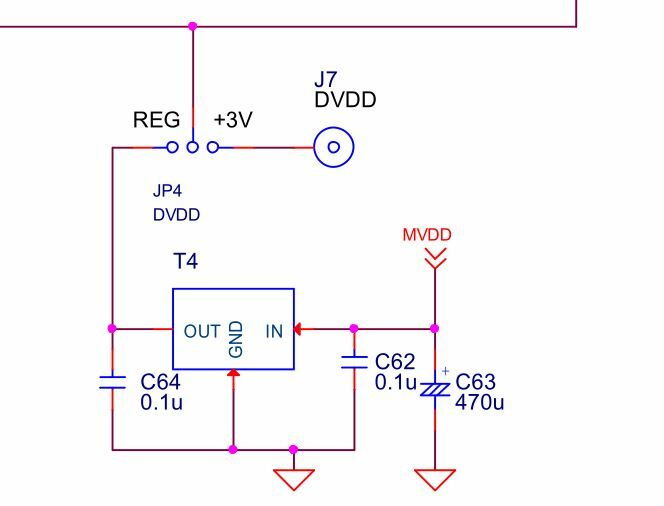 The 5V supply connects to VDD (5V Analog supply input) and Reference Voltage High (VREFH) -as recommended in the data sheet. The differential voltage between VREFH-L/R and VREFL-L/R sets the analog output range. The VREFH-L/R pin is normally connected to VDD (analog 5V supply), and the VREFL-L/R pin is normally connected to VSS1/2/3 (analog ground). 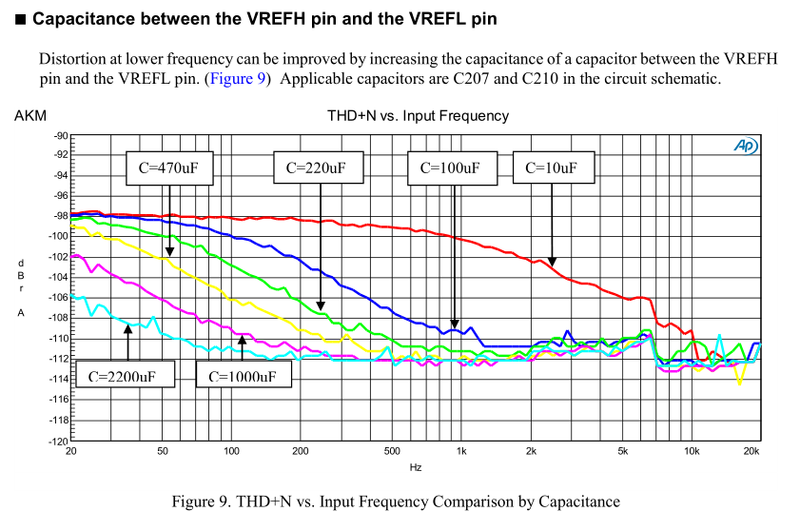 VREFH-L/R and VREFL-L/R should be connected with a 0.1µF ceramic capacitor as near as possible to the pin to eliminate the effects of high frequency noise…All signals, especially clocks, should be kept away from the VREFH-L/R and VREFL-L/R pins in order to avoid unwanted noise coupling into the AK4490. The Diyinhk board is implemented with 2200 uF capacitors, achieving the best THD numbers. (The larger capacitor holds the reverence voltage stable -perhaps an even larger capacitor would further improve the low frequency THD numbers). There is an option to use separate supplies for right and left VREF and VDD. This also follows the scheme implemented in the official evaluation board where the left VREF is separately powered from the right VREF. Special designs techniques for sound quality are applied to each blocks for achieving balanced, smooth and powerful signal flow. In addition to L/R perfectly symmetrical layout, more than 5x trace width is used for signal line compared existing products, supplying rich current to analog signal output blocks. 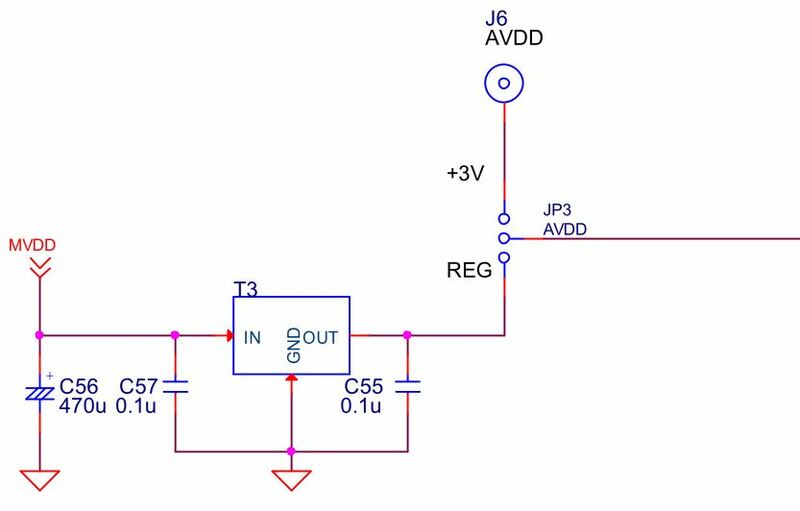 To achieve low impedance, two analog power supply pins and two signal reference pins are assigned for each channel, allowing the system to utilize thick PCB trace pattern giving low impedance sources. 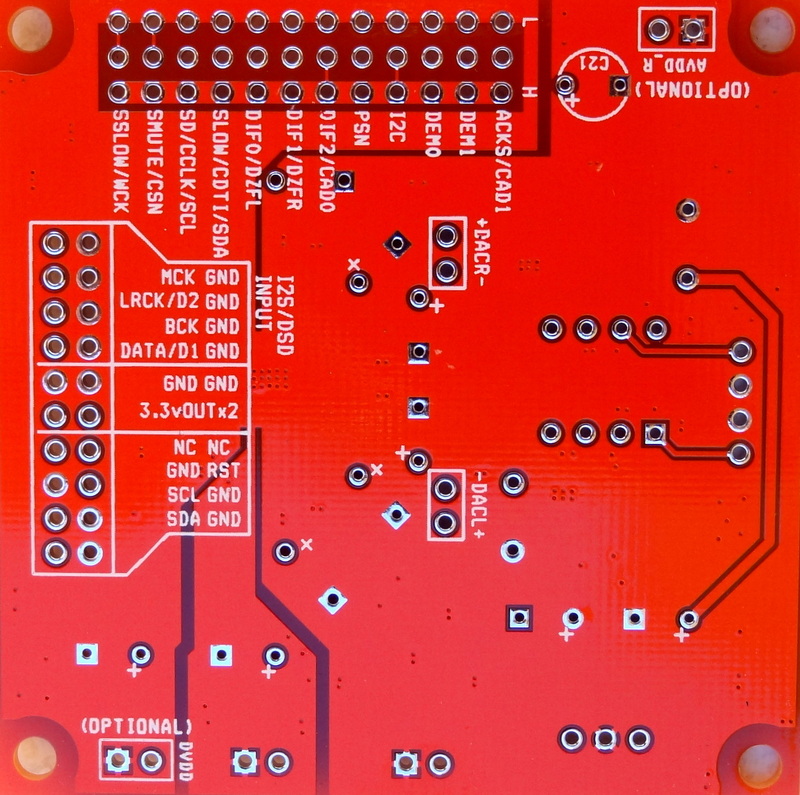 The official evaluation board has a provision to separate the VREF from the Analog 5V VDD which is not implemented in this board. 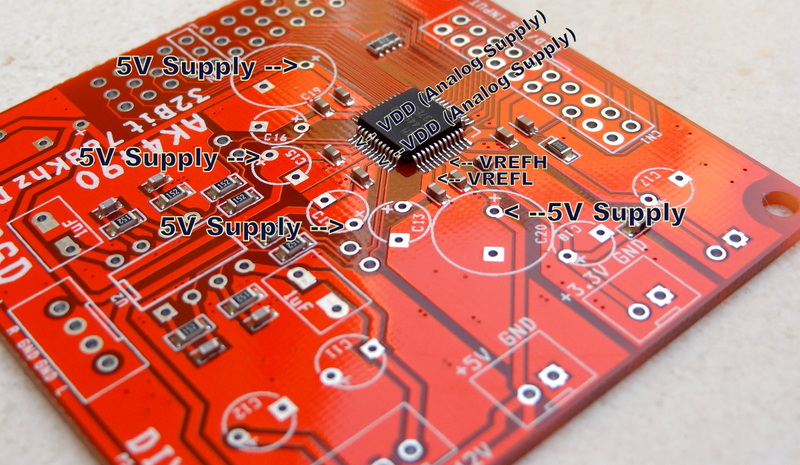 However, it is easy to mod and use separate supplies for VREF and Analog 5V VDD. There is a 3.3V analog supply pin and a 3.3V digital supply pin in the chip. The default implementation of the diyinhk board uses the same supply line but filters them with a ferrite bead. 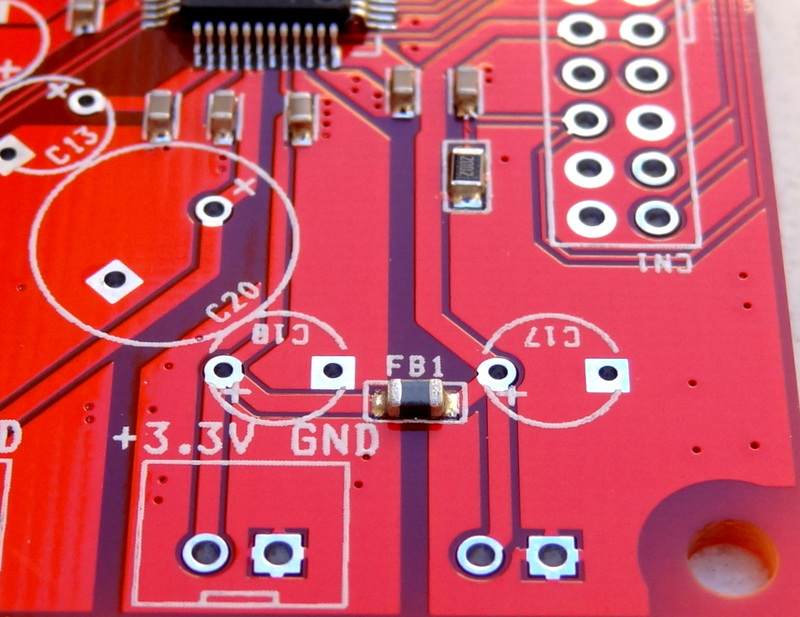 By removing the ferrite bead, the user can use separate supplies for the analog and digital 3.3V. Fortunately the new DAC supports I2C protocol (and maintains support for the original 3-wire serial interface found in older DACs). This greatly facilitating the interface to a microcontroller such as Arduino because of their built-in support for more standard protocols such as I2C and SPI. The advantage of using the S/W interface is that it supports features such as volume control and DSD which are not available through the H/W interface. 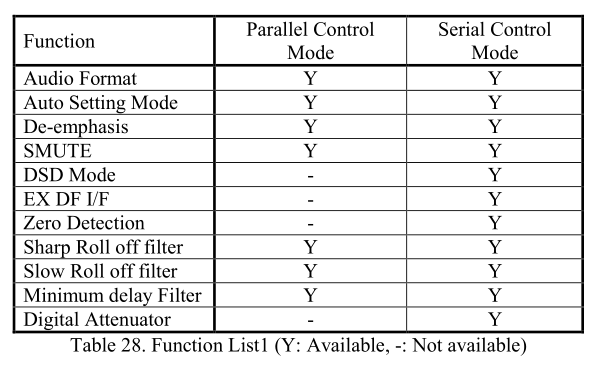 The following table summarizes these features that are available in H/W interface (parallel interface -by pulling hardware pins up or down) and S/W interface (serial interface -microcontroller control). Not indicated in the table is the “super slow roll-off” filter which is enabled by a register setting in s/w mode. Here I summarize the register settings and the different functions that can be programmed. I also attempt to do some “translating” of AKM’s vocabulary to more “traditional” vocabulary. I was able to communicate with AKM to clarify the functionality of certain sections. I was given an eval board for the DAC about a year ago. I would say it is very good – but it’s ultimate performance is hindered by its voltage output arrangement. It’s actual dynamic range is less than the WM8741. Still I liked the sound coming out. It’s not at all bad. Seems to require external MCLK, correct? I don’t see an XO on the diyinhk board. So,a more complicated setup for something like a Raspberry Pi implementation? Also, does it switch automatically between PCM and DSD like the ESS 9018? And finally, you’re busy writing code to implement volume control, filter selection and an LCD for this new board, aren’t you BlgGear?? Aren’t you….. please….surely you can’t resist hearing those new filters!! In addition, it does not “automatically” switch between PCM and DSD, so it requires external detection of DSD signal and some programming. The output LPF does not seem to be 3rd order as in the AKM data-sheet for PCM. Do we know why? I think what is implemented is a simple differential summing circuit as shown in circuit 1 of page 62 of the datasheet. The 3rd order pass circuit in the datasheet is to meet the SACD Scarlet Book specification. The DAC implements and internal filter to attenuate the noise generated by the Delta Sigma modulator beyond the audio passband. Page 62 example 1 shows 390 ohms resistors and 3 caps per channel and there is only 2 caps/channel and no 390 ohms resistors on the pcb…Example 1 is not only a summing circuit but also a LPF…. Im about to get one. Any news? It sounds……..marvelous! Best dac board I had so far. Nothing to complaint. Hey Fab, what clocks are you using in this board? I am using the XMOS board also from Diyinhk which has 3 clocks. Great! Gonna place my order right now! Do you know if one Xmos board is able to drive 2 AKM boards in mono config? It should. Just duplicate the I2S connections to the second board and set the MONO channel accordingly. 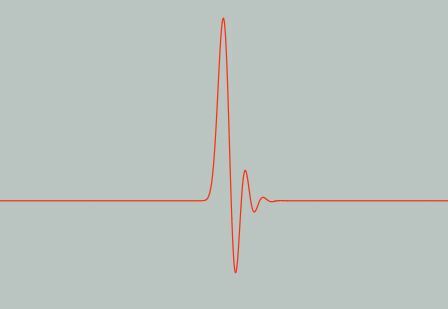 I want to try the other digital filters (other than default) to check the effect on the sound. Do we know if it is configured in parallel or serial mode on the Pcb? PSN does not seem connected thus does it mean parallel mode? I got confirmation from DIYINHK that the DAC on the board is set in parallel mode by default. As per my observation, the digital filter is actually set by default to “Short Delay Slow Rolloff ” which is the second best one (sharp edge) as suggested….the AK4490 doc is not that clear if we can set the filter for the “best one” thus “Super slow Rolloff ” in parallel hardware mode…. If I got it right it looks like we have to cut a trace on the back of then pcb where “SSLOW ” pin is already shorted to GND (“LO”) to get the Super Slow filter on by then adding a jumper to “hi”…, am I correct? It would make sense to pull pin 6 “High”, but the english language in the data sheet seems odd: “The AK4490 can be operated on a slower sampling frequency. This mode is available when the SSLOW pin =“H”. just got this board (after reading about it here, thx!). I am trying to get i2c working using a beaglebone black. So far it does not show up, what is the minimum of connections to be made to get i2c going (do I need to provice a MLCK)? Yes, I2C for control. Sound is working fine, have not got I2C to work. Any pointers? OK, got I2C working now! Good to hear. Are you able to select the filters? Any impressions on the different filters? Hi, any progress on the code? Im about to place an order on diyinhk’s PSU’s to use on 4490EQ. what do you think about the psu? Do you think its need to use separated rails to analog and digital? In the evaluation board, AVDD and DVDD are powered by separate regulators. Should result in some improvements. You may want to build it as-is and then separate the AVDD from DVDD to evaluate the change. The kit makes it easy to make the change. Dual AVCC 5.25V for analog L/R, one trident 3.3V for Analog, one trident 3.3V for digital and one 3.3V trident for clocks on isoltaed xmos side. Transformer are also important, so e.g. : “toroidy pl audio supreme v2”. For Balanced to SE conversion I will use my current LL1684 transformers or maybe “lampizator amber tube stage”. I didn’t know TPA would build custom voltage tridents. 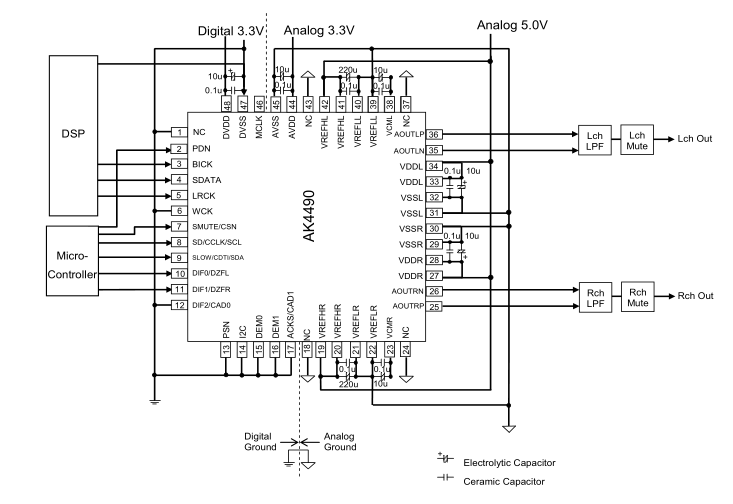 I would focus on getting a 5.x V Dual AVCC to power the analog 5V. Since it is dual supply, you can separate R/L. Also to consider is the large default capacitor used for analog 5V. For shunt supplies, smaller capacitors are recommended (ask TPA for max value). In the Buffalo implementation, there are no large capacitors after the regulators. If using the shunt regulators, you still need a regulated input source to the shunts. But it starts to get kind expensive if its needed a source to use with shunts. Would be interesting if we could choose a 7V from TPA to use in analog path. M are you from Poland? “Also to consider is the large default capacitor used for analog 5V” – I obviously use none for my es9018k2m. Maybe I can think of using some small ones as you suggest. “If using the shunt regulators, you still need a regulated input source to the shunts.” – as I wrote Placid HD 2.1 is also needed. “But it starts to get kind expensive if its needed a source to use with shunts” – but it is worth it! More clarity, more depth, sounds have shape and is more “touchable”. What I would be really curious how it sonically performs vs. ESS DACs. I have a Lampizator Amber containing ES9018K2M chip. Can anyone confirm if this dac supports dxd at 352.8 KHz ? The data sheet does not mention this rate, jumps from 192 to 385. Is anyone using Arduino With this board? Whoops, I meant to ask if anyone is using Amanero with this board, not arduino. Please Explain how to turn mono mode to connect two boards for dual mono. I would like to use two boards for dual mono as well, but then doesn’t the external LPF circuit have to be changed? hello, how to play DSD, or has anyone i2c program arduino? 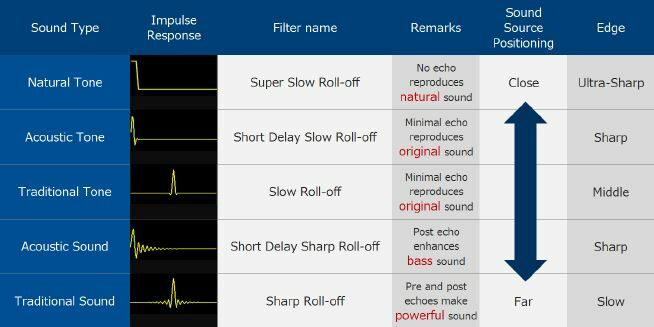 Anyone compared Ak4490 with ES9018K2M for sound? I have Es9018K2m combo Xmos from DIYINHK with AD797 op-amp. Nice, live and neutral sound. I wondering if AK4490 has better SQ. So I have tried es9018k2m, ak4490, ak4495. All of them with triednts shunts and placid hd 2.1. All of them worked with lundhal transformer as output stage. Only ak4495 worked with Lampizator Balance SE tube output stage, because it does not generated dc offset. All of them worked however with lampizator amber tube output stage. I like ak449* better than sabre. Maybe sabre would work better without asrc (do not know, did not try). Anyways my best combos so far is: ak4495 + salas refelector D + lampizator balanced SE. Czy m ożesz podać maila, chciałbym pogadać o twoim dacu. Dear M, thank you for posting your comments about the es9018km, ak4490 and ak4495. Which ak4495 are you using ? The diyinhk ? WaveIO or JL Labs USB to I2S > DIYINIK AK4495 or ES9018 with Salas refelector D ? I am a hardware guy an have designed a lot of DACs since early 80s. But I have realized that one has to learn the software part to get what you want this days. So I have to say that I am pretty bad on that part. Anyway I am trying to get I2C control to work with this board. No luck so far. My question is. 00100 CAD1CAD0 R/W and it should be for CAD1=0 and CAD0=1 and R/W=0 to write to the device 00100010 and that is 0x22 what is correct in this case? It is DIYINHK USB>I2S attached to it. Can someone point to the right direction? The device address of Sabre DAC Datasheet specifies the address as 0x90 which is an 8-bit value. depending on whether you use the write call [beginTransmission()] or the read call [requestFrom()]. Therefore, you will use the 7 most significant bits of the 8-bit address. The R/W code is inserted automatically depending if you are writing or reading. For the value you want to write to register 0, check page 54 of the data sheet. First of all I have to thank you answering my questions. I realized that it was 0x11 when I read your K2M code yesterday. CAD0 goes to high with a stripe on the bottom side of the board. I didnt want to cut it so 0010001 (0x11). I could set the registers and read them afterwards to verify the change. What I am missing is some kind of reset after I setting the new values. I suspect that it is the reason I dont get any sound on the output. But as you said I will try different values. My thought was if someone here has done that before maybe I could save some time. I got this up and running the other day. My build included a http://hifimediy.com/i2s-DSD-isolator, and sparkos lab dual discrete op amp. I’m using my gustard u12 as a transport. Sounds great. i want control the dac ak4490 with i2c, but my arduino not detect it. on the card,i configured the pin psn=L and i2c=H. i plug cable sda and scl on the card. someone managed to control the dac with i2c? I found why the dac did not answer. It must also connect the gnd pin of SDA and SLC. I am starting to refactor the code to work with AK4490 and just completed the hardware. Would appreciate if anyone who has refactored the code to work with AK4490 can share it – Work in progress code is fine too. Thanks! Still no way to make this work with Rpi 2 ?? Anybody have any Arduino Code for this? I would prefer to start with a base rather then from scratch? Can somebody please help me with the correct configuration of a wiring the analogue outputs of a dual mono Vout DAC? I know for a current output DAC its a parallel connection,the Right + is connected to Left + and Right – is connected to L-. Instinctively, the connection for a Vout DAC is a series connection? ie. 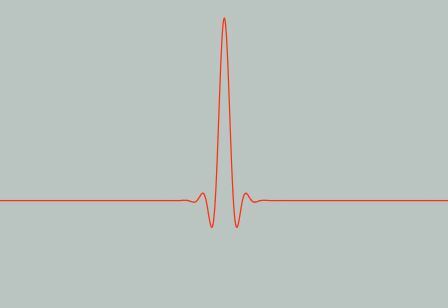 R- connected to L+? However the AKM 4497 Page 94 Datasheet seems to show a parallel connection, same as a current output DAC? 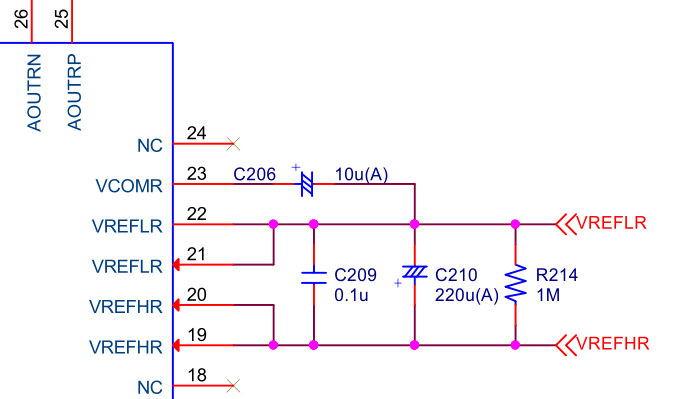 For a series connection would I need to invert one of the channels in serial mode? May I ask how to make AK4490 work with RPI3? I got a RPI3 , an AK4490 board from DIYINHK, and a external TCXO at 24.576Mhz for MCLK. I connect them together, and there is no sound out. Is it the driver problem of volumio or else? I have the AK4490 working with RPi2 via an Allo Kali reclocker which can provide the MCLK. I’m using the ‘Mamboberry DAC+’ setting on Moode and upsampling to 24/96. Just adding a warning that at some settings (eg. 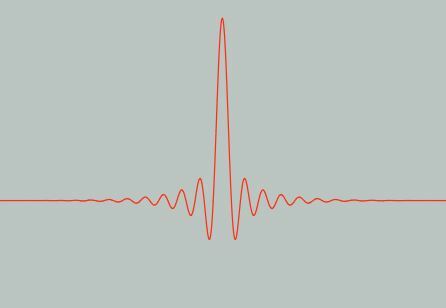 resampling ‘off’) you can get an extremely high-level blast of noise that your speakers may not like.